The LMI E7 Series Metering Pumps are designed for use in hazardous environments. It meets or exceeds all standards for Class I, Division I, Groups C and D; Class II, Division I, Groups E, F and G. The rugged, urethane coated, cast housing and encapsulated electronics provide excellent chemical resistance and long life. 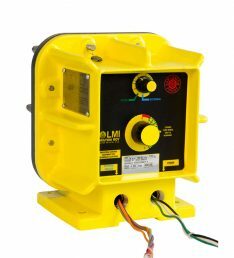 LMI E Series Features include: Rugged, urethane coated cast housing for applications in hazardous environments, Manual control or external control without the need for costly motor and control options, Designed to meet or exceed all standards for Class I, Division I, Groups C and D; Class II, Division I, Groups E, F, and G, UL, CUL Certifications.